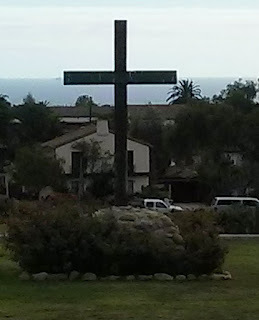 While some Christian communities practice separation from public life, including refusing to vote or serve in the military and other coercive forces, for the most part Christians down through the centuries have made their peace with citizenship in what Augustine referred to as the "City of Man." We live, Augustine and others who followed him, with a foot in each realm, with duties to both. While I have argued strongly that our ultimate allegiance must be to God (as laid out in the Lord's Prayer), and that this allegiance should guide the way we live in society, I also believe it is important for people of faith to engage the public square. It is my belief that we have duties as citizens of both realms, which I believe emerge from the two great commandments. We are to love God, but also love our neighbors. To be a neighbor is to show mercy toward the other (Luke 10:25-37). I have tried to be involved a variety of ways in contributing to the betterment of society. I do so motivated by my faith. I have been involved, for instance, in community organizing efforts (though I'm taking a break from active participation at this moment). As an expression of this commitment I've taken on a new responsibility. 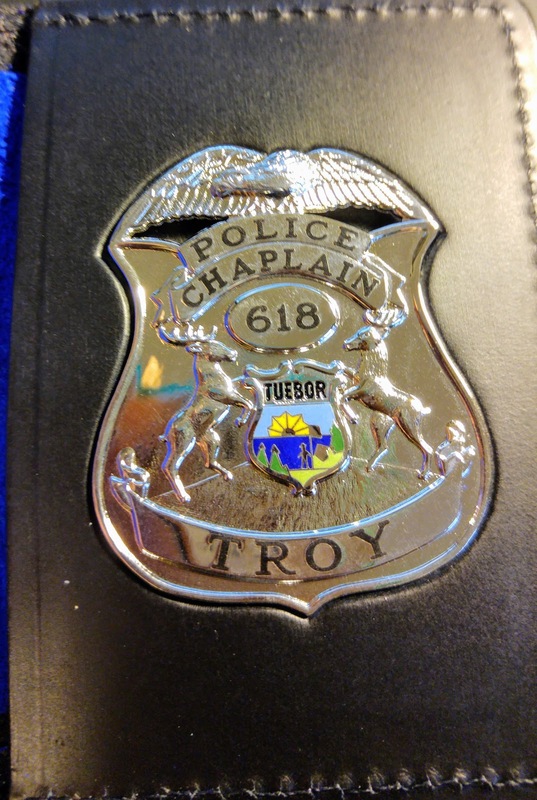 I have been appointed and cleared to be a chaplain for the Troy Police Department. I know have my ID and my badge. Yes, I have a badge. It looks like any police badge, except it says Police Chaplain. I am not allowed to arrest anyone! I am taking on this new role for a couple of reasons, but mostly because I see it as a way of serving my community using the gifts and calling provided to me by the Spirit. It is not easy being a police officer, even in a rather safe suburban community like Troy. Some feel called to the work, which can go unappreciated. It's a bit like being a teacher. We want good teachers, but we're not sure we want to pay them commensurate to what we want from them (being a public school teacher is another important area of public service). The reason for doing this kind of work is not to proselytize, but to give care and support to others, especially those in need. It also allows me the opportunity to be a bridge where possible with the faith communities (drawing especially on my interfaith work). I'm looking forward to with the officers and staff, along with service to the broader community. One duty to which I may be called is to accompany an officer delivering a death notice to a family. I may be called out to assist in ministering to people in a serious accident or tragic event. I don't know where this will lead, but for me it is a way of living out my faith in service to my neighbor. That is, showing mercy to the other. With that I'll invite you to pray for me and those called to protect and serve the populace.